Personalised Rectangle Printed Glass Photo Frame. 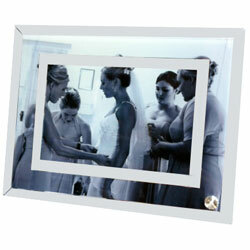 This beautiful glass frame measures 230mm x 180mm x 5mm. It has two mirrored borders, optional extra of adding engraving to the inner border on the frame. Your photo is heated directly onto the photo frame. Suitable for portrait or landscape orientation. We can use full colour or black and white images. Should you opt to have engraving we have a selection of fonts for you to choose from. There is no limit on the amount of characters you can have but please remember the more you have the smaller the font size will be.